IT'S HOT IN BENBOW. YOU NEED TO SPEND ONLY A FEW MINUTES TO begin sweating in the glare of the southern Humboldt sun. Instinct draws you to scan the horizon for anything to help you cool off -- an ice cream store, air-conditioned building, a giant block of ice. 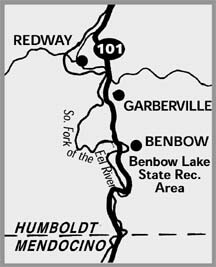 Luckily, Benbow, located just a few miles south of Garberville on Highway 101, has a great swimming hole. 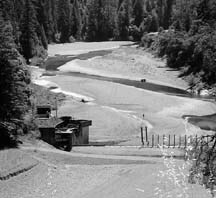 Benbow Lake, caused by a temporary dam on the South Fork of the Eel River, has been a place for southern Humboldt to chill out since it was first installed more than 70 years ago -- with the exception of last year. Last summer the California Department of Parks and Recreation did not fill the lake because it was preparing to make some major repairs similar to those made in 1986 (see separate story). But the job was postponed by the listing of the steelhead trout as threatened under the federal Endangered Species Act. Although the repair work was never performed, the lake is once again filling for the summer season until federal agencies can sort out conflicting needs and the overall issue -- a growing consciousness of the effects of dams on fish populations. Benbow Lake, full and empty. The dam is up for environmental review. It looks like there may be significant problems with the structure, which some believe is preventing salmon and steelhead from accessing habitat further upstream as it warms water downstream above healthy temperatures. Benbow Dam "has been a fishkiller from the get-go," said Harry Vaughn, a fisheries restoration worker with the Eel River Salmon Restoration Project. "The dam blocked fish passage the first year it was put in," Vaughn said, and to some extent it has ever since. The dam is only in place from June 15 to Sept. 15, when salmon are theoretically not active in the river, but Vaughn said that "salmon migration changes every year," and that in some years -- including this one -- the migration can occur up to a month late. Keeping the water still also allows the sun to heat it up, Vaughn said. "It holds it up and gives it a larger surface area," raising temperatures. Warm water is a proven salmon killer; just last year, thousands of coho were killed in the Klamath River when water got too warm. Those problems are being evaluated, said John Clancy, fisheries biologist with the National Marine Fisheries Service. The dam is being looked at as a potential barrier to fish migration, source of sediment pollution, cause of temperature pollution and a drag on the aquatic insect population that the salmon use as a food source. So far, the dam has been able to get the go-ahead because salmon do not spend the summer in that part of the river, Clancy said. But the listing of steelhead trout as a threatened species under the Endangered Species Act last year has brought the prior environmental analyses into question, because trout do spend the summer and breed in the river. 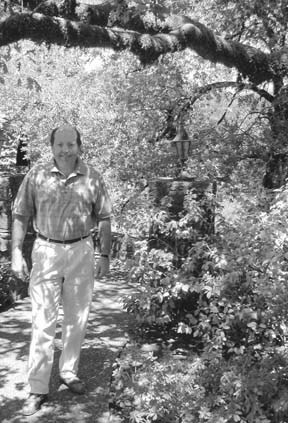 "Whatever they decide, they'll decide," said John Porter (in photo below left), co-owner of the Benbow Inn, a luxury hotel that has shared the valley with the dam since 1931. The hotel uses the lake as a recreational draw, Porter said, and it is important to his business -- and it probably isn't responsible for the salmon fisheries' collapse. "I'm not a biologist," Porter said, "but I personally do not think it adversely affects fish. If that dam was put in in 1930 and fishing has gone sideways in the last 10 years, it's not the dam." The fisheries have been declining for a lot longer than 10 years, Clancy said, although it has become most apparent recently. And while the dam probably isn't single-handedly killing Eel River salmon, every little bit hurts. "The analogy I would use is that if someone is ill and then requires surgery, there is a much greater chance they will not survive if their body is stressed by preexisting conditions," Clancy said. Complicating the issue is the fact that surgery is required -- the need for major capital improvements on the dam to repair years of erosion. The Eel River carries a high level of sediment, and the constant passage of sand and gravel over the steel and concrete of the dam has worn the structure down. Repairs include work on the concrete, and the steel wearplates that act as armor for the dam must be replaced. The listing of steelhead made it seem unwise to spend the approximately $700,000 needed to do the job. Parks and Recreation will wait to see if NMFS is happy with the dam before committing, said Doug Correia (in photo below right), park maintenance chief with the department. The department is in a tough position with Benbow dam, he said, because it has to juggle two priorities. "There are two missions for state parks: To protect and preserve natural resources and to provide the highest quality recreational services. "Sometimes," he said, "these two goals come into conflict." "I think recreational wants are a valid concern of society," said Vaughn. "I don't want to be the bad guy out there saying not to put in the dam. "But how do you balance the recreational wants of society against the needs of the fish?" "Through discussion," said Nadananda, executive director of the Friends of the Eel River, a group that has worked to raise awareness of the problems in the waterway. Nadananda said she has had several people express their concerns about the dam to her, and she thinks there are more people who have valid input on the problem. The point isn't to advocate for the dam's removal, Nadananda said, but rather to look at the situation with an open mind. "It's possible there may be some alternatives we're not thinking about," she said. For instance, the fish ladders on the dam are thought by NMFS not to work -- "But what would make them work?" she asked. IT'S A QUIET SUMMER AFTERNOON at Freshwater Park. Unusually quiet -- the playground is empty and the diving platform deserted, both devoid of the crowd of kids that would normally be there. A county recreational facility that normally brings in $2,000 a month in revenue has turned into a ghost town. The park is open, but its main attraction, a swimming hole made by damming Freshwater Creek, is not. 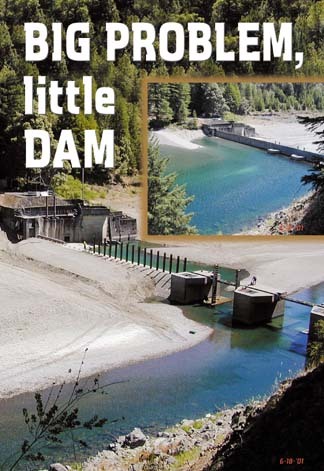 Acting on concerns about salmon habitat voiced by the National Marine Fisheries Service and the California Department of Fish and Game, the Humboldt County Department of Public Works decided not to install the dam that would have created the pool. It is the first year without a pool since the dam was put in place in 1979. "We visited the site in response to a citizen complaint regarding some work that had been done in preparation for the dam being put in," said Dan Free, a fisheries biologist with NMFS. Along with a county representative and a biologist from Fish and Game, Free concluded that there had been work done directly in the stream channel -- a no-no because of sediment that gets released into the waterway. But that wasn't the biggest problem they discovered. After noticing the low water flow in the stream -- Freshwater is at about half its normal level in this drought year -- Free asked how the county goes about filling the pool. "They divert 80 percent of the flow to the pool and bypass 20 percent," Free said. Leaving only a fifth of the small creek's already low flows would strand fish below the dam, he said. "After talking about it out there at the site, we pretty much agreed that it would be detrimental to the fish." What's unusual about his case is that it took an impromptu visit by regulatory agencies to put the wheels of species protection into motion. Normally, a project that has that great an effect on a fish-bearing stream would have to be licensed by the Army Corps of Engineers. The corps would have then asked NMFS to look at whether the dam caused problems for salmon. Richard Stein, environmental services manager for the county, said he had asked the corps whether a permit was needed and was told no. That's not surprising, he said, because "under normal circumstances, with a normal winter and normal flows for late spring and early summer, the dam does more good than harm." Stein has documentation to back up that claim. Last year he wrote a negative declaration of environmental impact, a document required by the California Environmental Quality Act. In that document he maintained that the dam didn't adversely affect the fish at all. During the public review process, Stein said, "everyone had a chance to shoot at it. We had no comment." The pool can actually be beneficial to salmon habitat, Stein said, because it provides a place for fish to hide from summer heat and predators. "If they have eight feet of water they're much less vulnerable to kingfishers than if they have two inches," Stein said. Free said habitat wasn't that simple, however. "That pool is pretty much devoid of cover, which is also an integral part of habitat," he said. He agreed that it may have provided a cool spot in which salmon could escape warm water, which can easily kill the fish. But the main issue isn't the pool itself, Free said, but the fish caught below the dam. Even if the pool created ideal habitat, fish below the dam wouldn't be able to access it. Juvenile salmon move up and down streams, Free said, and those that move below the dam before it gets put up "won't have the opportunity to move up to places where there is better habitat." The long-term fate of Freshwater pool remains open. Stein and Free said they will meet later this year to discuss the dam's impacts on fish and possible solutions to the problem. BURT AND HELEN BENBOW hadn't planned on building the Benbow dam themselves. 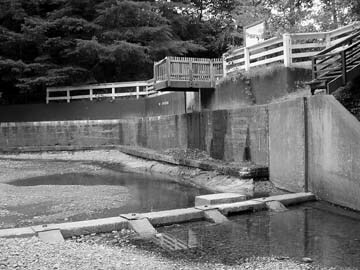 After they finished the construction of a English Tudor-style luxury hotel in 1928, the two members of the Benbow clan most gifted with engineering prowess had decided to put the construction of a dam on the river out to bid. But times were tough and the lowest bid came back in at much more than the Benbow family could afford. The Depression and the large financial obligations the family had accrued in the construction of the hotel forced the Benbows into undertaking the mother of all do-it-yourself projects: a hydroelectric dam. 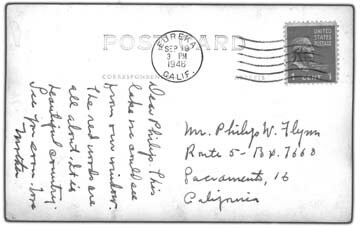 Front and back of a historical postcard written from the Benbow Inn. Burt, a watchmaker and engraver with several patents to his credit, drew up the plans. Helen, who had acted as the general contractor on the hotel, oversaw construction. 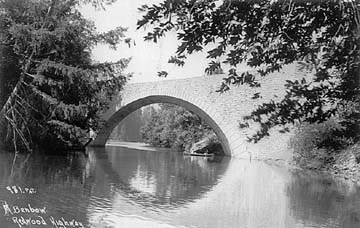 Together, they built the entire dam in the dry season of 1931, creating a recreational resource and a power generation facility for the hotel and the town of Garberville. Whatever you think about the current status of the Benbow dam, the resourcefulness and daring of the Benbow family merits noting. 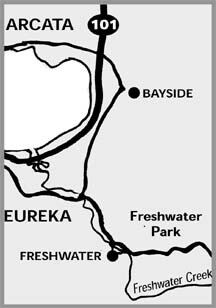 Having lived in northern Humboldt for 30 years, the group bought an entire valley just south of Garberville from Ernest Linser in 1922. When the sheep ranch they started proved insufficient to meet their needs, they took another tack and decided to build a luxury hotel. When a group of investors tried to stage a hostile takeover of that hotel during the Depression, the family fought it off by selling the hotel to friendly investors who would let them buy it back. So when it was decided the hotel, which celebrates its 75th anniversary this year, needed electricity, the natural thing to do was to create a supply. Historical accounts relate that members of the local community used to stand on the banks of the river and place bets on when -- not if -- the dam would fail. One of the contractors who had bid on the project frequently came down from Eureka to watch the construction and be on hand for the distress call he assumed he would receive from the Benbows. That distress call never came, construction was finished in just one season and the original dam is still being used today. 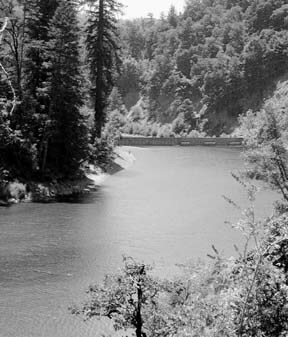 The hydroelectric turbines went quiet when cheaper power became available through PG&E in the 1950s, and the dam was bought by the California Department of Parks and Recreation in 1956. The department changed the dam from a year-round operation to a seasonal one, removing and installing the facility every year. In 1977 $1.5 million was spent to install fish ladders to make fish passage possible and to remove a sand and gravel deposit from behind the dam. In 1986, $360,000 was spent to replace the steel wearplates which shield the dam from being eroded by gravel carried downstream by the current. That's the same repair job which the Parks and Recreation Department faces today, although the price tag has increased to about $700,000 and concerns over fish habitat may stop the dam from being put in at all after this year. 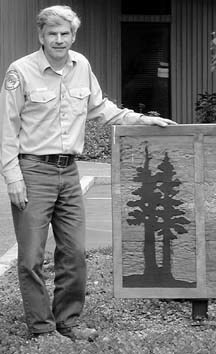 That would signal the end of an era, said Doug Correia, park maintenance chief with the department. "It's a one-of-a-kind structure in the state park system," he said. "It's unique." The Benbow Inn will be having a dedication ceremony to celebrate their 75th anniversary July 17, 2001, at 4 p.m. The ceremony will honor the memory of the nine brothers and sisters who built the Inn, the dam and the dream of a resort community in southern Humboldt. © Copyright 2001, North Coast Journal, Inc.